Puma next month releases the Beisser, a limited edition ‘forward-lunging’ trainer that comes under the company’s design-focused series, In Collaboration With Ourselves. As the German name suggests, the Beisser shoes ‘bite’ the ground with jagged and pronged soles. 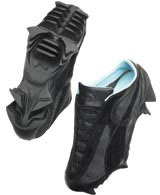 Designed by Puma’s Boston team, the back plate has teeth-shaped rubber lugs for braking and the uppers take influences from rock climbing and street fashion. Just 500 pairs of the Beisser will be sent to retailers, presented in an acrylic case.